About 5,000 varieties of wildflowers transform a car window’s view of the Texas Hill Country into a live-action Van Gogh. Taking routes on ranch roads and well-trodden highways, we zigzagged the map, in no rush at all. Our love affair with the road reaches new levels in the Hill Country, where highways crisscross a landscape blanketed by blooming flowers. Awed at every turn, we glided down tried-and-true routes and hidden backroads, blissfully aware that in the Texas countryside, the ride is the destination. The Hill Country’s topography resembles a piece of paper that has been crumpled up and straightened out again. Inconstant, rolling, packed with surprising creases and shifts, it provides the perfect, uneven canvas for nature’s paintbrush. And oh, is it painted! Especially in spring, the green hills are ablaze with wildflowers in every hue. Bluebonnets, with their vertical shafts bedecked in deep blue blossoms, dominate the view from mid-March to the end of April, when they begin to fade. They’re rivaled in vibrancy and number only by the Texas paintbrush, an annual that owes its red-orange brilliance to its bracts, or leaves, not its petals. Paintbrushes are hemiparasitic, meaning their roots siphon off nutrients from surrounding plants. Growing side by side in fiery patches among the cool-colored bluebonnets, they wage a silent battle for territory, and our eyes reap the benefits. The countryside boasts an estimated 5,000 varieties of wildflowers, including violet winecups, yellow square-bud primroses, and pink Indian blankets. Drivers who happen to pass through become de facto gallery visitors, a wall of art on each side of the road. 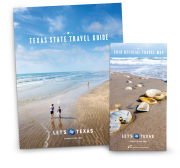 We decided to take a long tour: a 250-mile-plus route that begins in New Braunfels, just 30 miles north of San Antonio, and loops clockwise to end in Austin. Including pit stops and our leisurely driving speed, it took us about four hours overall. From there, we turned left on Ranch Road 470, down a meandering path through an undulating landscape filled with junipers and oaks. From there we boomeranged northward and eastward on a route that included several ranch and farm roads and U.S. 83; the roadside brush was ensconcing. Heading east to Vanderpool, we navigated several twists that offered panoramas of the Frio and Sabinal River gorges. And the eastward drive on Texas Highway 39 to Kerrville totally blew us away, with a tree-lined stretch of road that made us feel as if we were navigating a lush, natural maze. Once in Kerrville, we were in a part of the countryside where wildflowers rule. 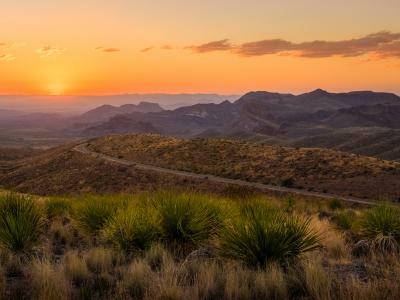 The very familiar drive from that point—northwest on Texas Highway 16 to Fredericksburg, then west on U.S. 290 to Austin—is well worth the hype. The indigo glow of bluebonnet patches soothed our eyes, Texas paintbrushes speckled the roadside thrush, and the quaintness of the towns invited us to stop and stretch our legs. Who were we to say no? For a shorter trek—the round trip took us about an hour and a half—we tried the Willow City Loop. We headed north from Fredericksburg on Texas Highway 16, passed the Farm Road 1323 junction that leads to Willow City, and kept going on Texas 16. Hitting Ranch Road 965, we turned left and traveled west. Our destination? 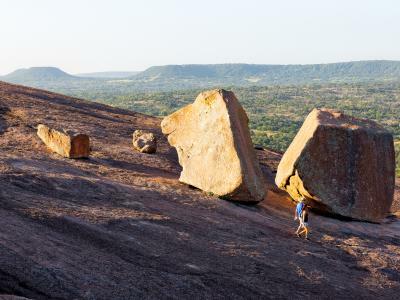 Enchanted Rock, a giant pink landform that has inspired Native American myth and tourist fascination due to some very odd behavior: it emits flashes of light and noises because of the granite’s expansion and contraction. The scenery to and fro? Astounding. Cliffs and valleys of boulder and brush, bluebonnets and paintbrushes in their eternal struggle, and meadows strewn with bright pink phlox. Former first lady Lady Bird Johnson is partly responsible for the thriving of the state’s wildflowers. She established an initiative to conserve natural landscapes and had many road medians seeded with flowers. The Lady Bird Johnson Wildflower Center in Austin is open to visitors seven days a week.